Well, the summer holidays are well and truly over, the tan has faded and the aroma of sun-cream is no more, but wait..it’s not all doom and gloom. I’ve got some great news to share with you… I was given the honour to be a part of the TrancefamilyUAE second birthday celebrations event. 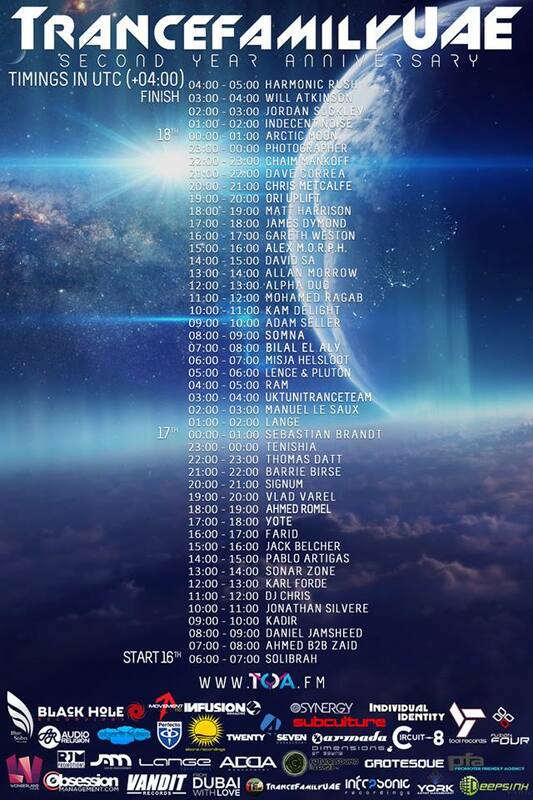 The line up read like a ‘who’s who’ of the trance scene with such talent as Photographer, Manuel Le Saux , Jordan Suckley, Chaim Mankoff, Gareth Weston, Harmonic Rush, Karl Forde plus many more. The sets will all be available to ‘listen again’ on TrancefamilyUAE mixcloud and youtube etc soon. Make sure you visit their facebook page for more information on this and on their other events. Also, I have made a special ‘Above All Records‘ promo mix featuring some of their new releases. You can listen to the mix here – Above All Records Promo Mix I hope you enjoy it and please…feel free to repost/share it. This entry was posted in News and tagged "Sonar Zone" Trance TranceSOu, #trancefamily trancefamilyuae, Above All Records, mixcloud, Photographer, toa. Bookmark the permalink.